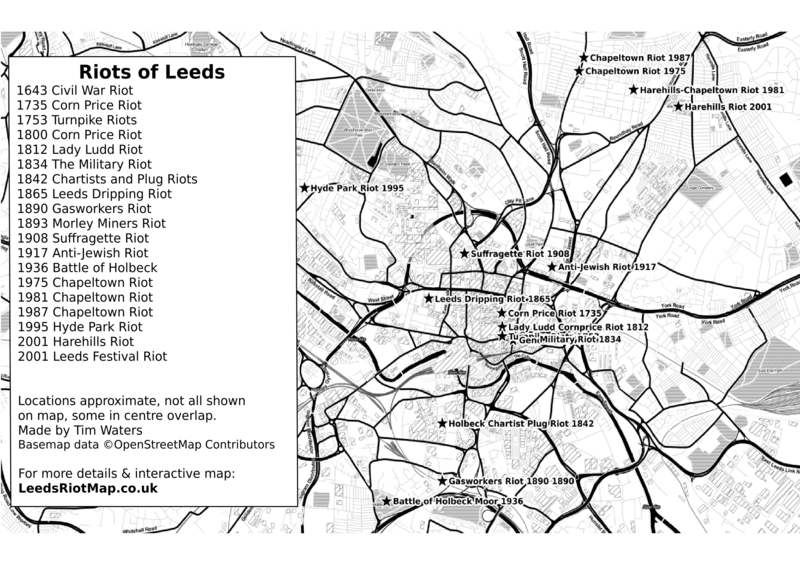 From varied causes and peoples including Chartists to Suffragettes in many places including Holbeck to Chapeltown the City of Leeds has seen many riots over the years. 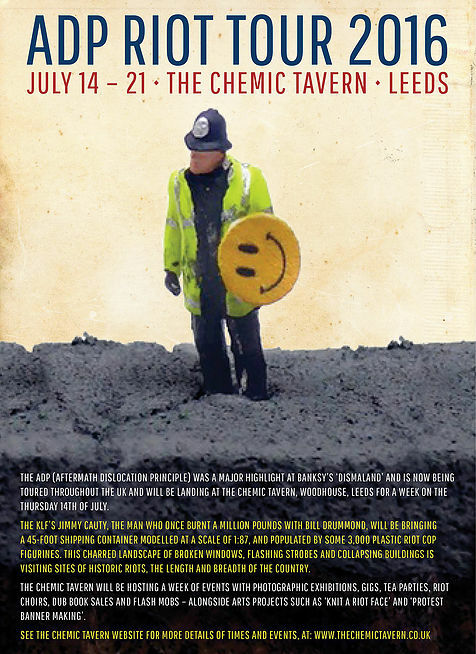 Made for James Cauty's ADP Riot Tour visit to The Chemic Tavern, Leeds, 14-21 July 2016 (poster, more details), the Leeds Riot Map shows 21 riots from 1643 to 2002. Mobile users can also download this static map. Much of the information here is borrowed from the excellent Ford Maguire Society publications. The curious visitor wanting to learn more is encouraged to visit the Ford Maguire Society website. During the Civil War, Parliament forces assaulted Leeds on January 23rd 1643. A demand for the town’s surrender was issued, but the Royalists dug in for a fight. The outer defences were overrun, and house-to-house fighting quickly descended into Royalists running away. During this assault, the Whitecote area near Newlay bridge (named after a “White Coat” Royalist regiment) saw a popular uprising in support of Fairfax. This might be the first recorded Leeds riot. "On account of the exportation of corn, on which there appears to have been a bounty, the prices of provisions greatly advanced, the indignation of the populace was roused, and tumults broke out in various parts of the kingdom. The conduct of the rioters in Leeds was so violent that the king's troops were obliged to fire upon the multitude, and eight or nine of the people were killed"
Turnpikes, and toll roads, roads that you had to pay money to go on were introduced were very unpopular with the people. The people determined to destroy the toll bars and the houses of the collectors. They demolished the gate between Bradford and Leeds, and also those at Halton Dial and Beeston. Three of the rioters were arrested in Beeston, and shown before the borough magistrates then assembled at the King's Arms Inn, in Briggate. The mob having in the morning rescued a carter who had been seized by the soldiers for refusing to pay toll at Beeston, assembled before the inn with the determination of liberating all the prisoners, and they soon broke the windows and shutters of the house with stones which they tore up from the pavement. The magistrate ordered out a troop of dragoons but the mob furiously assaulted them as they had previously done the police. The troops were commanded to fire first with powder and this producing no effect, with ball. The people then fled in all directions, leaving in the streets about ten persons killed, and 27 wounded. Some of the latter afterwards died, and many others were injured. This tragic and notorious riot was known in following years across the country as "The Leeds Fight". August-September 1754. The Vicar of Leeds appointed a new minister for Holbeck without asking the people. This was a new vicar and had several issues with the towns parish chapels - each local chapel claimed the right to nominate their own minister. Apparently the new minister in Holbeck was chosen as a favour to his family. When he came to do his first service he was blocked by around a thousand "furious, frantic, lawless" group of people, angry at the corruption. The people assaulted the curate with dirt, stones and bricks. And the reverend had to leave. The trouble lasted for weeks, and eventually, on the fourth attempt, he was able to get into the chapel abd speak his sermon by the use fifty armed dragoons provided on the order of the towns magistrates. The disturbances continued, and it was reported that the "rabble" subsequently broke into the chapel, tore up books and even human fecaes were produced and smeared on the walls and seats! The newspaper reports that one person was charged with the poo smearing the following year. The vicar published his sermon entitled: "The Behaviour of the Apostles Paul and Barnabas, Together with That of Some Riotous Opposers of Their Ministry Occasionally Consider'd in a Sermon Preach'd at Holbeck, in the Parish of Leedes. To which is prefix'd, a preface, Giving some Reasons for the Resignation of that Curacy." St Catherines Chapel (which had existed since the early ninth century) was demolished in 1836, St Michaels Church was built on the land next to the graveyard of the chapel. Riot of women and boys led by "Lady Ludd" at Corn Market in Leeds where also food shops were threatened. The person of Lady Ludd appeared on the 18th August, heading a crowd of people on Briggate where the market was being held. As they pressed up the street they heckled and badgered corn sellers, bakers, meal sellers, and farmers. There were confrontations and assaults. With certainty food and wheat were taken by the hungry. Then two days later, this time she was more demanding, with the weight and power of the ordinary people behind her. The crowd seized potatoes that were being sold, and she ordered shopkeepers to lower their prices. It was just one of many similar actions across the North of England as desperate times drove men and women to the brink. Green Man pub, Kirkgate & Green Parrot, Harper St. In the area of the Green Man on Kirkgate, there were reports of soldiers making indiscriminate attacks on the population. In June, matters reached a head when violence between the general population and some soldiers of the 70th infantry (exacerbated by anti-Irish sentiments) broke out at the Green Man. Police called at the pub to arrest some soldiers named as responsible for beating a resident, Edward Thompson, but they were booed by an anti-police crowd as they led the men away. A fight ensued between police and soldiers, and the prisoners were briefly freed; they were later recaptured along with others and imprisoned. After appearing in court, these men were convicted and sentenced to imprisonment. To quell tension, the military were confined to barracks but orders were disobeyed, and many gathered, heavily armed, in the Green Parrot on Harper Street and went in search of revenge against the police. In major pitched battles that followed, the police came off worse, often with the population actively supporting the soldiers, but in some instances with civilians supporting police against army in a complex political situation. Following this riot, officers kept troops under control but the population was still in aggressive mood and further battles between a mob and the police occurred in Briggate which were only quelled by cutlass-wielding constables. "Around 10 thousand marched down Meadow Lane and from Holbeck and broke into Marshall's mills. They stopped the engines at Benyon's mill. From there they proceeded to the shops of Mailes and Marsh where a number entered by the watch house door and opened the large gates. Immediately the yard was filled, the engine stopped, the bell rung and the men were turning out, the mob began to leave the yard. At this instant Mr. Read Chief Constable rode into the yard amongst them, he was quickly dismounted but beat off the mob with his stick. A general rush was made to the gate and when the greater part had effected their exit, a large body of police arrived and closed the gates, thus capturing a number of prisoners. The people seeing only a few policemen made an attack upon them with sticks, bludgeons and stones but were eventually compelled to fall back without gaining possession of the yard. The volley of stones poured upon the police was terrific for a short time. When the military arrived they were speedily dispersed up the road and across the fields in all directions. The masses who were of our own population expressed freely openly and loudly their sympathy with the rioters. About four o'clock the Riot Act was read and two pieces of artillery were paraded into Holbeck. Between thirty and forty prisoners were taken but only so far as we could gather on very trifling charges." Following on from the above riot in Holbeck, the next day the Chartists and people marched again and successfully shut down colleries, factories and mills. They had a large meeting on Hunslet Moor. The police were called in with 600 soldiers and broke it up. A huge crowd of 8,000 to 10,000 marched through Calverly, Stanningley, Bramley and Pudsey stopping all the mills and factories on the way. Almost all mills were closed with no trouble except for Banks Mill in Far Pudsey. The crowd rose up at the refusal to stop work and started destroying the place. "At this time a few of the 17th Lancers arrived accompanied by two of the Messrs Eyres of Armley. The Riot Act was read and a few minutes allowed for the people to disperse. The people however instead of dispersing moved in one vast body on the military, which only numbered thirteen privates and one superior officer. Seeing the vast superiority of numbers, the soldiers prudently turned their horses heads and retired followed by the groans of the people and a few stones which served to quicken their pace." On 23rd January, Mrs Eliza Stafford, cook to a surgeon and magistrate Mr Henry Chorley, of 8 Park Square, came before local magistrates accused of stealing 2lb of dripping. She was found guilty and imprisoned for one month in Armley. Her case was widely publicised and occasioned huge public sympathy - even in 1865 the offence of stealing a bit of dripping was regarded as relatively trivial, and as the month of incarceration proceeded, the local working class become increasingly incensed about the Dripping Injustice, with widespread public bad feeling and disorder. On Tuesday 22 February, Eliza Stafford's was due to be released and at about 9 am a crowd of several thousand gathered outside Armley Gaol in expectation of the release. However Stafford had been released earlier around 7 am and had left Leeds to travel to Scarborough where her daughter lived. The crowd, denied its target, mostly dispersed but about a thousand people marched from the prison to Chorley's house in Park Square and threw stones that broke several windows in the house. The Chief Constable of Leeds, William Bell, and some police officers managed to form a cordon round the house and withstood several attempts by the protestors to break through the police line to the house. During the lunch hour the numbers of people in the square increased as workers came to view the affair. The Mayor of Leeds, John Darnton Luccock, worried by the crowd called for assistance from Bradford police and from the army at York. At 1 pm as many people left the square, their lunch periods over, the police decided to try and clear the square. After issuing a notice ordering the crowd to disperse, the police charged and drove everyone out of Park Square; during the charge one man, George Hudson, was trampled and severely injured - injuries so severe that he subsequently died - and a number of men were arrested for riotous conduct. This effectively ended the riot and reinforced by the Bradford Police with two troops of the 8th Hussars from York on standby, the Leeds police prevented any further attempts at disturbance despite a sizable number of people assembling nearby in the evening and attempting to march upon Leeds Town Hall. In Summer, the gasworkers union were on strike and the town council brought in "blackleg" workers from London and Manchester. Huge crowds gathered at Meadow Lane to “persuade” the blacklegs to depart, which many did. By evening, a crowd of 10000-15000 was charging the works and conducting pitched battles with the police, resulting in a large and very bloody battle. Police were drafted in from Bradford, York and Huddersfield, and large number of foot and mounted soldiers also deployed. At around 8pm on Tuesday 1st July some 260 blacklegs, in company with the Mayor and other civic dignitaries set out, guarded by a force of some 500. The scale of public excitement and hostility can be judged by the numbers outside the Town Hall, estimated at 30000. The procession approached the railway bridges close to the works, which had been occupied by the gasworkers and their supporters, who started to direct a major bombardment on the police and soldiers below. The pro-union crowd at this point was estimated at 15000 people. The forces of law and order fought back, and the armed military indicated their desire to open fire; most of the blacklegs were hustled into the works. On Thursday 7th September 1893 at the height of the coal miners strike, it was reported in the Ossett Observer that a serious encounter took place at Chidswell on the Ossett boundary "a mob of between 2 and 3,000 men was marching in the direction of Ossett. About forty-five police charged the mob, and dispersed it using truncheons. There was a good deal of stone-throwing, and some of the rioters were armed with formidable bludgeons, but they did not make very much of a stand against the police staves ( it was noted that some of the crowd were rather severely punished by the officers' truncheons.) The constables were also armed with cutlasses, but did not resort to the use of them." On October 10th 1908, the (Liberal) Prime Minister Asquith visited Leeds. The Suffragette and Suffragist movement had been active for many years in pursuit of votes for women, and took every opportunity to challenge and embarrass the government. The meeting for the PM was planned in the Coliseum and a great number of the tickets were overstamped “Men only”, and the door stewards were commanded to not allow any woman not holding one thus stamped; this was because the organisers knew that the suffragettes could disguise themselves to make them appear fully respectable members of a Liberal audience. Meanwhile, in Victoria Square, a large meeting of unemployed took place by the Leeds Permanent Committee on Unemployment, chaired by a man, Mr. Kitson. As the PM Asquith approached the Coliseum, some 600 or so men moved up the hill to where Ms Baines was declaring that unemployment was “more a woman’s question than a man’s, for it was the wife that had to meet the landlord’s demand for rent”. Precisely what happened next, and what was intended, remains unclear. The press, in the form of the Evening News and the Leeds Mercury, agreed that Ms Baines was heard to say “Break down the barricades and compel a hearing”, but it is not clear if this was intended as an explicit incitement to the men to interpret her literally. Whatsoever, there was a rush of people which was subsequently interpreted as a riot, although the only recorded damage was a broken pane of glass. It seems one stone was thrown which a policeman claimed had hit him, but no injury was recorded, to him or anyone else. In Leeds, Kitson and five suffragettes were arrested. Trial proceedings dragged on into the next year and the excitement subsided, but Jennie Baines is recorded the honour of being the first suffragette to be imprisoned after conviction. On both evenings, trouble flared after gangs (mostly young and male) gathered at the borders of the area and started smashing windows, with whole streets of shop frontages being wrecked; there were also instances of looting. After the first night’s trouble, affairs escalated and events on the second night involved rather more people active over a wider territory, up into Mabgate. On the evening of the 5th June a very heavy police presence prevented any recurrence and there was no further report of incident. The cause of the only recorded anti-Jewish riot in the city is not wholly clear from the reports. During the trial of some of those arrested, Supt. Blakey of the Leeds police was asked what lay behind it, and replied “It is difficult to say … I don’t think I should attribute the blame to anyone”. The Yorkshire Evening News reported that the culprits were predominantly young (14-20 years old) and suggested that events were a form of retaliation for the behaviour of gangs of “Jewish lads” in Briggate. The Mercury alluded to long running bitterness between gangs of “English” and Jewish youths, with the former claiming provocative behaviour by the latter; it was also suggested that feelings were running against Jews because of an alleged reluctance to sign up for military service (vehemently denied by the Elders of the Leylands). When the dust settled, most sentences were relatively minor; the press passed on and the local columns devoted rather more space to those found guilty of hoarding food. Most pages, of course, were devoted to news from the front and the endless columns of names of dead Yorkshiremen – an anti-Jewish riot wasn’t seen as that important. On two days, Thursday 5th and Friday 6th May, during the General Strike, there were significant events in the town centre, both revolving around the continued operation of (some number of) trams and buses which were maintaining a reduced level of service. On both occasions, a crowd of some thousands is reported as gathering in the neighbourhood of the Corn Exchange, Boar Lane and Briggate. On the first day, a tram was compelled to stop in Duncan Street, and many of its windows were broken by missiles of coal being thrown from an appropriated lorry. There were many instances of police use of horses and truncheons, and several minor injuries and arrests. On the following day similar crowds were stoning buses and trams. One of those arrested, Violet Snowden, was told by the magistrate she confronted “You women ought to use your influence to keep the menfolk quiet”. On 27th September 1936, following a week of tension during which the British Union of Fascists was forbidden by the city's Watch Committee to march through the Jewish quarter (Leylands), Oswald Mosley paraded over 1000 uniformed Blackshirts in Calverley Street, and marched them to Holbeck. Opposition to the event had been organised and publicised some days previously, with the Communist Party taking the lead; relations between the left wing parties being what they were, the Labour Party refused to take part in the protests. The newspapers reported that there was a huge crowd of 30,000 on the moor with a very significant hostile element. As Mosley spoke, the Red Flag was sung repeatedly in efforts to drown him out, and a large number of stones were thrown at the fascists. Many of these found their targets, with Mosley himself being struck. The city magistrates moralised endlessly in the week that followed, but punishments for most of those apprehended were light. There had been a history of harrassment and wrongful arrest within Chapeltown by the police - and mainly targeted towards black teenagers. The area of Chapeltown, once a wealthy victorian neighbourhood had degraded over the years with the usual effect of poverty blighting it. Black immigrants made Chapeltown their home. On 5 November, Bonfire Night, "between 150-300 mainly black youths raced through the streets hurling missiles and fireworks and attacking the police who were sent in to contain them"
It was reported that it was sparked off by an attack on an unmarked police car after which uniformed police arrived en masse. Two such policemen narrowly escaped death when their police car hit a tree after geting hit by a brick. Twelve young people were arrested, and six prosecuted in court. They pleaded not guilty. They defence included police fabrication of evidence, police lies and confessions based on voilence and intimidation of the arresting offices. On July 11th, after 6 weeks, the jury aquitted them of 21 out of 25 charges, and it is thought they it was because the all white jury had also had experienced similar behaviour from the police. Britain was in recession. Unemployment was high, especially among the young, and among Britain's black, white and asian population. The riots (which occured across many parts of the UK) were exasperated by widespread distrust of the police and authority, and were pecieved by many communities as race riots. The disturbance started near the Hayfield pub, the pub and the area around it allegedly had a reputation for drugs and violence. 200 to 300 people took part, many of them white (in contrast to the events of 1975) Black and white youths were said to have caused 2 million pounds worth of "damage, as burning, looting and fighting with the police on Chapeltown Road and on Harehills Road broke out over the nights of 12-13 July." 43 people were injured. Twenty four people were arrested and most were convicted. During the nationwide riots, Margeret Thatcher, the Conservative Prime Minister, considered actually arming the police with guns and live ammunition. For two nights in June there was rioting. buildings burnt and looted and cars were set alight. The rioters included black, white and asian youths and was reported to have been started because a local black youth was arrested and subsequently underwent extreme brutality by the police. He was arrested, wrote The Times newspaper, after a gang kicked a police car. Later that night, about 100 youths got together and threw bricks at police cars and damaged a couple of shops. A taxi was also hijacked and set alight. The times wrote that Chapeltown "still has housing problems. Unemployment among black youngsters runs at about 50 percent". The violence flared in the Hyde Park area of the city after police executed three warrants following a tip-off about armed robberies. Rumour and paranoia had made the area volatile during several weeks preceding Monday night's outbreak of arson and skirmishes with 100 riot police, residents said yesterday. Up to 150 youths set fire to cars and a pub, threw petrol bombs at police, and damaged property. Alarmist accounts of the raids raised tensions among the youths, who claimed police had assaulted women, torn ornaments from the walls and, in one incident, searched for drugs inside a child's trousers. "These are police with attitude. They have a gym where they work out, they're body- building to police this area, and they've been provoking people now for two or three months," one youth said. Suspicion was aroused about police tactics in the area when high-intensity lighting was installed around the Jolly Buffer pub - still known locally by its former name, the Newlands. Under new ownership, the pub - which was burnt out in Monday night's violence - had attempted to improve its image, but one of the new landlords were suspected by local youths of being a former police officer. The other landlord was injured in an attack by youths two weeks ago, since when the pub had been closed. With commanding views of an area where local youths congregate, the pub was also believed to house a police surveillance unit which gathered intelligence for the recent raids. The new flood lights installed increased that perception. The pub was burnt down and eight cars were also destroyed. The riot started as a protest, again, against violent policing. There was six hours of rioting and 25 cars were torched, shops and other premises wrecked and buses and cars stoned. The violence involved up to 300 youths. 25 people were sentenced for arson and violent disorder. 23 of those sentenced were british asians. On the last night of the Leeds Music Festival. 44 people were injured including one policeman that needed hospital treatment for a suspected broken nose after 500 visitors at the Leeds Festival ran riot in the early hours. Police helicopters were asked to come in and people lobbed missiles at it with more burning toilets. Following years, Leeds Festival was moved from Temple Newsam to Bramham. Prosecutions followed and the judge decided against jailing the first troublemakers to be sentenced, including the 18-year-old son of Martyn Jones, Labour MP for Clwyd South. 8 of the teenagers were given a £500 compensation order.